The Lord and the Lady Belhaven and Stenton, Rt Hon the Baroness Boothroyd, HM Ambassador of the United Kingdom to Poland Jonathan Knott, Prof. Norman Davies, Prof. Timothy Garton Ash, Mayor of City of Cracow Jacek Majchrowski, President of Cracow Industrial Society Tadeusz Syryjczyk. What is the Last Night of the Proms? For over one hundred years the most important musical event in Great Britain has been the annual London festival taking place in July, August and September – the Promenade Concerts. Its conclusion and culmination is the Last Night of the Proms – a ceremonial concert at the Royal Albert Hall, during which famous British compositions, among other pieces, are performed to the delight of the excited audience: Land of Hope and Glory, Fantasia on British Sea Songs, Rule Britannia, Jerusalem. What is the Last Night of the Proms in Cracow? In 1996 Cracow Industrial Society decided to organise a replica of the Last Night of the Proms in Cracow and the concert’s success prompted the Society to turn it into an annual event. 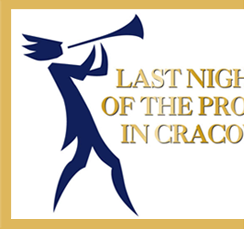 Today the “Cracow Proms” boast a tradition of their own that we can refer to. Over 40 soloists from Poland and abroad have performed in front of our audience, we have listened to a dozen of Polish premiers of international works of music, and the concert, primarily dedicated to the British who work in Poland, has turned into an annual meeting place of the Polish and international business community as well as music lovers. The Last Night of the Proms in Cracow is a unique, one of a kind concert experience: it combines the highest possible artistic standard with spontaneous behaviour of the audience which breaks into choral singing of the songs from the final pieces of the programme. The audience is inspired by the conductor to join in the fun and behaves less formally. Flags and hats distributed before the concert as well as the special decoration of the hall are conducive to such festive atmosphere.